Davidson College prepared for a tournament at Central Florida in 1989 and head coach Jim Stoekel looked to his top starter, Greg Wilcox, according to the Central Florida Future. "Wilcox," Stoekel told The Future, "is capable of beating anyone when he's on." Wilcox beat enough teams in his Davidson career to go on to the pros. However, Wilcox had few opportunities to beat teams there. He pitched in 13 games over a single season. 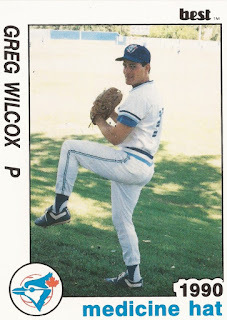 Wilcox' professional career began and ended in 1990, taken by the Blue Jays in the 31st round of the draft out of Davidson. Wilcox, on the mound for Davidson, beat Miami in a March 1990 game, throwing a four-hitter for his fifth win on the year. Wilcox won 12 games total in 1990 and 33 in his career there, both remain school records. Wilcox continues to hold several other school records. He struck out 17 in a 1988 game, tied for school best. He also holds the season and career strikeout marks. He made first-team all-conference in 1988 and team MVP in 1989 and 1990. Wilcox played at rookie Medicine Hat with the Blue Jays. He got into those 13 outings, starting one. He went 2-2, with a 4.21 ERA, marking the extent of his pro career.